There are a lot of electric motors out there, but just a few make up the majority of the motors being used in electric cars: the series wound DC motor, the permanent magnet motor, and the 3-phase AC motor. We'll talk about the pros and cons of each of these three types here. Cost. The DC motors usually cost less than AC motors, and you can find series wound DC traction motors in forklift salvage yards. Availability. 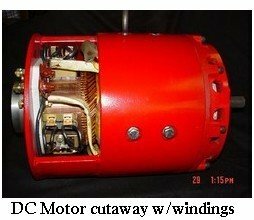 DC motors are often easier to find locally than AC motors. The "do it yourself" factor. Nobody wants a half-finished EV project scattered all over the garage, right? Simple installation is important to getting the job actually done, and DC motor systems used to be simpler to install than AC motors- until HPEVS AC motors came along and leveled the playing field. This motor is the king of electric car motors. It's also the king of torque! The electric drag racers burn a lot of tire rubber with this motor, and if laying down long black tracks and clouds of smoke is your thing, this is the motor you want. The Good: All the torque is available from a standstill. You've no doubt heard about this famous characteristic of electric cars. 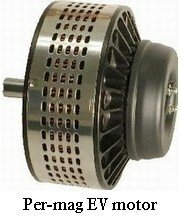 It's really a characteristic of these series wound DC electric car motors, though, rather than electric cars in general. These motors happen to be popular for electric drills, too, and that's why. The Bad: Not your best hill-climbing device. The Electrical Engineering training series says, quote: "Series motors cannot be used where a relatively constant speed is required under conditions of varying load." Unfortunately, that pretty much sums up what an electric car would be doing in hilly terrain, like my neighborhood. The DC series motor in your NEV might not climb those hills too briskly. Oh, you noticed this already? So did Zenn and Miles, actually...after 2008, all their new cars have AC drive systems installed. The Ugly: These always have to be run under load. Meaning, when you're installing your shiny new Netgain motor in that Chevy S-10 you've so carefully de-ICEd, you don't wanna hook the motor up to 120 volts and just whizzz it out attached to nothing (you know, to hear what it sounds like running); it'll take your head off. Apparently it turns with enough force to even damage itself if you run it without a load. You might never do this. Okay. But it also means that you can't use it with a belt drive, or a drive system that could fail like a belt could and leave your motor flying with no load - because it would destroy your motor if it failed. 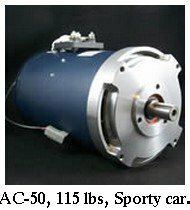 The Advanced DC Series wound motor is by far the most popular of the electric car motors, according to the EV Photo Album, followed by General Electric motors and NetGain motors. If you're buying them new, you find these through local EV parts suppliers - there's a list of US NetGain dealers here. These are the second most popular electric car motors in the EV Photo Album, but that's not necessarily because they're the best thing going. The biggest drawback with permanent magnet DC motors? They're noisier. Like all brushed DC motors, the brushes generate electrical radio interference. But unlike other types of brushed electric motors used in electric cars, like the series wound DC motors above, which have windings which provide natural filtering of electrical noise, the PM motors have no natural filtering effect in their design...so they're noisy. Most of the EVs with Permanent Magnet DC motors you find in the EV Photo Album belong to "small-ticket" EVs: bikes, motorcycles, scooters, and the like. This motor uses the same batteries the DC motor does; a DC power source. The difference is that an inverter takes the place of the controller you see in DC drive systems. The system overall is a bit more expensive, primarily because of these sophisticated inverters...but you get your money's worth. I'm very enthusiastic about these, it's no secret (check out my Best EV Motor Yet pick)! Why? An AC motor just keeps on accelerating - the torque curve is more like a gas-guzzler than a golf cart. An EV with a DC motor will reach the top of its RPMs, and that's all there is, there ain't no more. Example...55 mph the top end of your DC motor's happy place? You can cruise at 55 mph all day, no problem, but don't expect to reach 60 mph so you can get out of the way of that Hummer. Ain't gonna happen. Because the terrain around my house is hills, hills, and then a couple more hills after that. Like I said earlier, an AC drive system does a little better job in this terrain, all other things being equal. You can move a lot heavier car with an AC drive system. The range is better with an AC drive system, for a couple of reasons. First, because it uses lead-acid batteries more efficiently, and second, because of better regenerative braking, which acts just like a generator to put energy back into your batteries. If you're using lithium, AC/DC range difference is less of an issue. All these things add up to an electric car that's considerably more like the familiar gas-gobbler's performance. 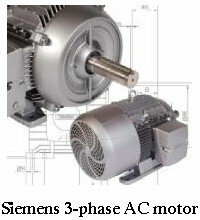 Metric Mind's FAQ has a lot more to say about the advantages of AC drive systems over the typical series wound DC electric car motors and controllers you often see in electric car conversions. Go from "Electric Car Motors" to learn more about the AC vs DC debate. Have A Question About Electric Car Motors? Can a motor power a 33' RV? Generator or Alternator To Keep EV Charged? Pump Motors Okay for Electric Cars? Electric Car Motor and Transmission All-In-One? Can I Retrofit my Car into a Generator Hybrid? Alternator to Generate Electric Power for EVs? Electric Car with a Generator on a Trailer? Why Can't an EV be More Like a Locomotive? Turn My Big RV Into a Plug-In Hybrid? Is a Generator an OK Electric Car Motor? How Much Electricity Does an EV Need? Which Electric Motor for a Civic Conversion? How Much Power Does an Electric Car Motor Need? New Subaru and Mitsubishi EV motors! Conversion Question: Power or Horsepower? Can I Hook the Electric Motor Straight to the Rear Differential? Nissan Frontier a Good EV Conversion Choice? Is this Hybrid Hummer the Real Thing?